Food on the Tyne is a Green Branch project started in 2014 following our Back to the Land II conference on alternative food distribution systems. It has been set up to bring food producers and consumers in and around Tyneside closer together and celebrate food production through sharing surpluses. We carried out a feasibility study into setting up a food hub in Wingrove in Newcastle, and the potential for this model to work across Tyneside. There is demand for a food hub in Wingrove and beyond! The food hub model could work in Wingrove and across Tyneside. 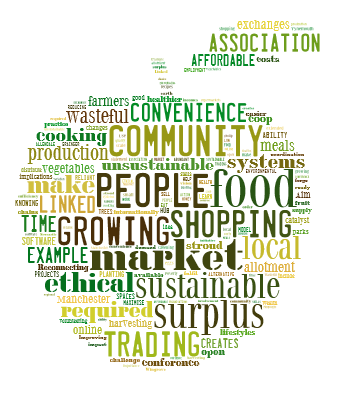 Community organisations would buy from a food hub, and help their members to buy from it. Setting up a series of food hubs across Tyneside would have economies of scale. Producers could sell larger amounts through a series of food hubs rather than through just one hub. There are producers who would like to supply the hub, but we need to identify more of them. The computer software we need to run the hub is available. Food hubs are not just a business but have a social and environmental purpose. There is demand for education about the food system. We are currently looking for further funding to identify more producers, and to run a trial in Wingrove. If there are any funders out there who would like to help please get in touch! The report is useful reading to anyone thinking of setting up a food hub in their town or city. It explains what they are, how they work, financial information and suggestions for working with community groups. Food Hubs are usually co-operatives that act as an intermediary, so that the people who grow and make food can sell their produce to the people who buy and eat it. However, unlike a conventional intermediary, such as a supermarket, the Food Hubs have a social and environmental purpose, as well as being a food business. To make it easier and more affordable to buy local food with shorter supply chains, both in distance and the number of people involved. To support small businesses and farms, with producers given a fair price for their produce. To support environmentally friendly farming and production methods. To create change in the existing food system. To increase understanding of food production and increase opportunities for people to be involved in food production. By acting as an intermediary it means that the producers of the food can focus on growing or making it, rather than having to spend a lot of time selling produce. (For example, on stalls at farmers markets or having to become experts in marketing and online selling). Surplus Sharing events – or Swop a Lots! People with gardens or allotments often have ‘gluts’ of produce in the late summer and autumn, with far more than they can eat themselves. We organised ‘Swop a Lots’ so they could swop their produce instead of it going to waste. Fruit, vegetables, eggs, cut flowers, jam, elderflower cordial, apple juice, homemade cakes, blackberries picked from the hedgerows, seeds, compost and plant feed from wormeries! We worked with groups and individuals across Tyneside in the summer/autumn of 2014 and 2015 to put on Swop a Lot events. If you would like to run an event this year, we can give you help and advice on how to make it a success. The Station Master’s Garden in Whitley Bay are planning a series of Swop a Lots during summer and Autumn 2016 – Watch this Space!